Incredible scrots, discussions and feedback all through January by everyone involved. Thank you! A light theme for spring. Left the terminals dark as that is more readable . 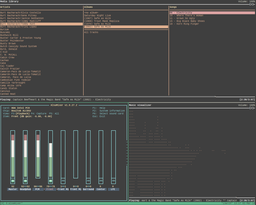 The top panel is bar (wip branch), popups are dzen2. Wallpaper: Somewhere on deviantart. Couldn't find it. Sorry. 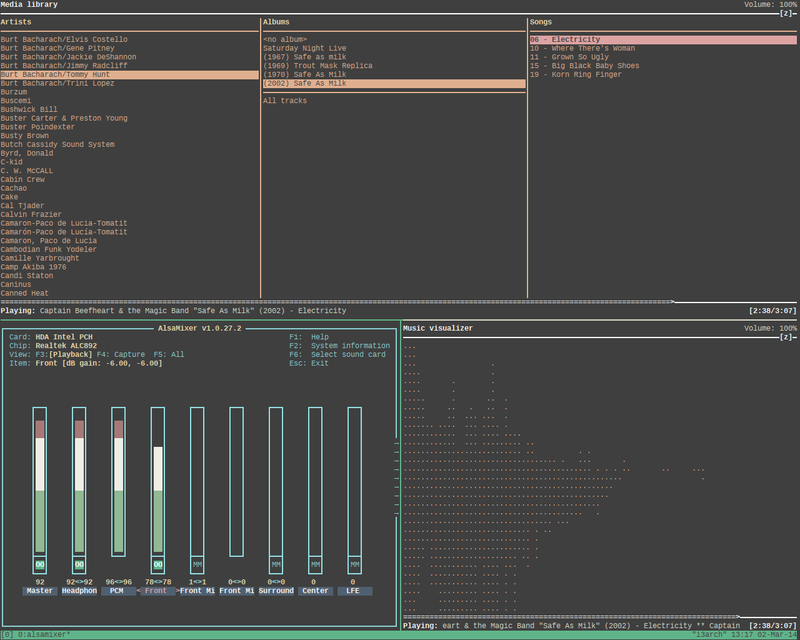 Window Manager: Stumpwm, Notifications: Dunst, RSS: Gnus w/ feed2imap, Gtk: infested-terran, Web: Conkeror with color-theme.js, Fonts: Terminus, Tamsyn, Dina. great config but i am unable to load bar. please help. My wallpaper changes every 15 minutes. Kinda fun. My first time using http://mediacru.sh. It's nice but I can't figure out how to make thumbnails. How's life without a bar? 1) This thread is for screenshots. 2) I can't really help because you didn't post any errors etc. check your settings to match your own setup. Also be sure to "man bar". 3) I recommend to visit 'Community Contributions' section and go to bar's official thread and make a issue report there. @drcouzelis: Hahaha, great screenshot xD! 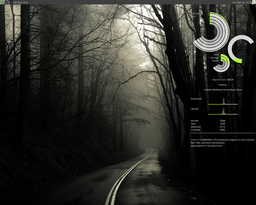 Got a fresh Arch Linux install, featuring Gnome 3, Droid Sans Font, Conky and Lightning <3, love it so far! Very productive system! 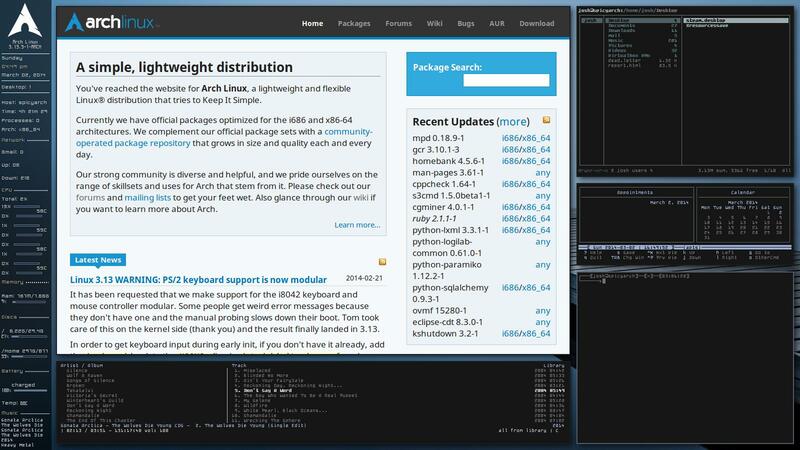 Still using Awesomewm. Main change is trying out termite in place of urxvt, I'm liking it. Alright guys, nothing much different from last month. 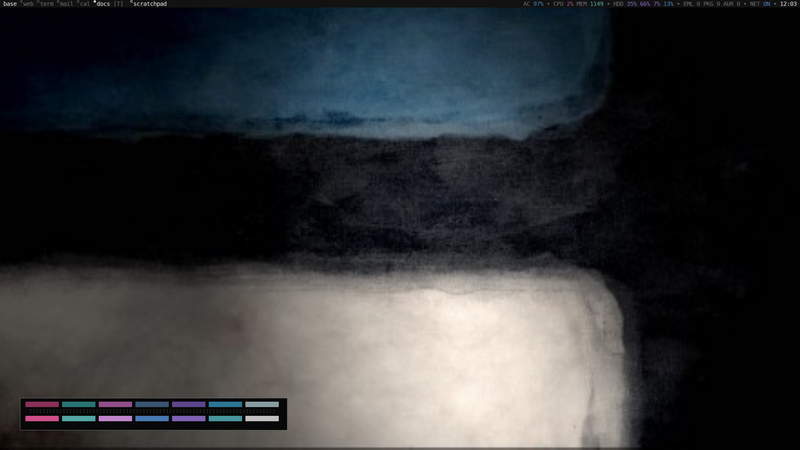 New colors, new wallpaper and new laptop, but same basic setup. Jason, hand over your conky config or else !!!!! I want to go back to dwm again --- although I am very happy with i3. 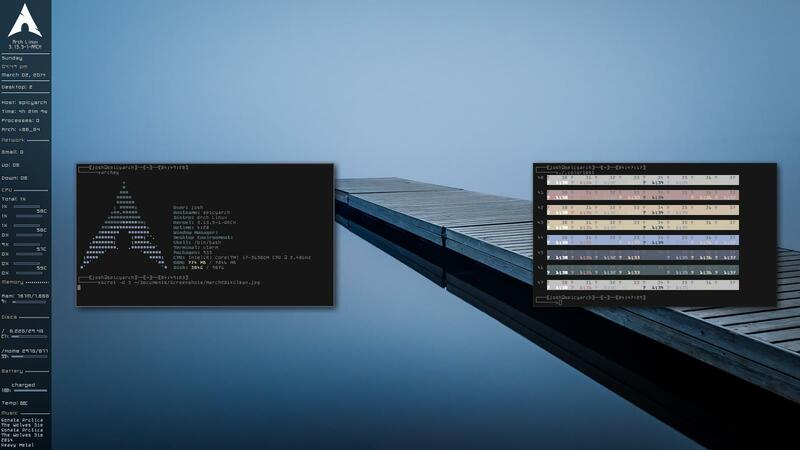 I love dwm and i3 as tilers. Thanks, of course I do not mind sharing!! The wallpaper's great, mind sharing it?